Welcome to our Sweets for My Sweet Blog Hop! With Valentines Day right around the corner, here are some fun and AMAZING projects to inspire your creativity!! The theme of this hop is, as the name implies, SWEET!! 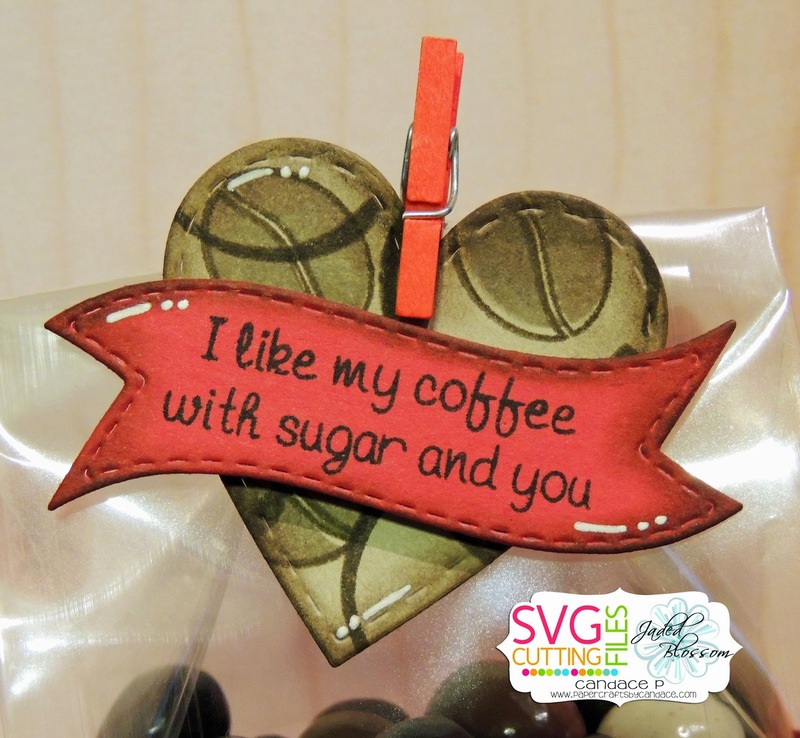 I used Jaded Blossom's Valentine Dies, Mini Tag Dies 2, Java Time and Paint Splatters. I filled a gusset bag with chocolate covered espresso beans for my hubby, he loves those things! I used SVG Cutting Files Decorate Edge Boxes and put my gusset bag inside. Here is a close up of mickey and the pattern on the box that I made with the paint splatters and beans from java time. I also added a little twine from Trendy Twine! Here is a close up of my tag! Thanks so much for checking out my project! Make sure to click below to request your files. You can't get lost on this hop with our fool proof line up below!! How cute is that Mickey???? Love it! omgs... so awesome... love the colors you used. I love Mickey!!! Great project! Oh my gosh! The original Mickey! Everything about this project came out too darn cute for words! I love classic Mickey -- and your project!! Mickey in the kitchen - bound to be a disaster somewhere! How cute! I love Mickey. I love this retro Micky. Adorable project. Wonderful! We love Mickey too! Love Mickey, he's my favorite! Mickey is great! And I love the sentiment too. Mickey is so adorable! Love your project! Mickeys so cute and I love the box. Love Mickey and the coffee heart plays well with the whole theme. OMG - just love this!! you did such a great job with this project - love all the detail!!! OOOO!!! I LOVE your Mickey!!!! He's AWESOME!!! Really like your project, thank you for sharing. Sad that this is the end. OMG!! I LOVE MICKEY!! What an AWESOME GIFT for your hubby!! So cute! Love all the little details you added! OMG this is too cute! I love how you made the pattern with the paint splatter and coffee beans! So freaking cute! i love the old fashion look to this! the box is so creative! Thank you for your talent and share!!! I love Mickey. He's so cute. What a lovey Valentine's Day idea. Thanks for sharing. I love everything about this gift box. it turned out great, thanks for sharing. I love your Mickey Mouse treat bag! So cute!! Oh, that's awesome, I love it. I love Mickey! thank you. This is absolutely adorable. Thank you. This is amazing! I really love all the little details, and that Mickey is just perfect! So cute!! Love your Mickey!! Awww Mickey is so cute!! Love it! Awesome job! This is really cute. I love this old time mickey! Vintage Mickey! I can see this used for so many other holidays too. Classic Mickey is so classy!!! Love your project! I have to confess....this is my favorite one! LOVE MICKEY!!!!! Coffee and Mickey, could it get any better? That's the Mickey from my favorite coffee mug! I love it! I love this and your stamping is fabulous. Lesson next scrap night??? Too cute...love the old fashioned Mickey!!! Was looking to see if there was a sneak peek in your project, LOL I love this cute treat and as always your cuts, color, and details are just spot on.. Why yes I am suffering Crafters Jealousy!!! TFS!! great project ....thanx to all for a great hop...too "Sweet"
This is awesome! Love vintage Mickey! Love your retro Mickey and the papers you used. This is beautiful. Awesome project to finish the hop. Thanks for the inspiration. Cute. Thank you so much for sharing! Old school Mickey how cute! This is awesome! Love the front panel with the beans and splatters - great job! Awww, I looove that old-fashioned Mickey! My mother would adore him! I'm glad to see Mickey joined the party today. Great project. Love the treat bag! I love old school Mickey! Awwww.... He is my FAVORITE of ALL characters!!!! LOVE THIS!!! That is seriously sweet and so me with my hubby! Mickey!!!!!!! Love your project. Thank you for sharing. Have a nice crafty day. 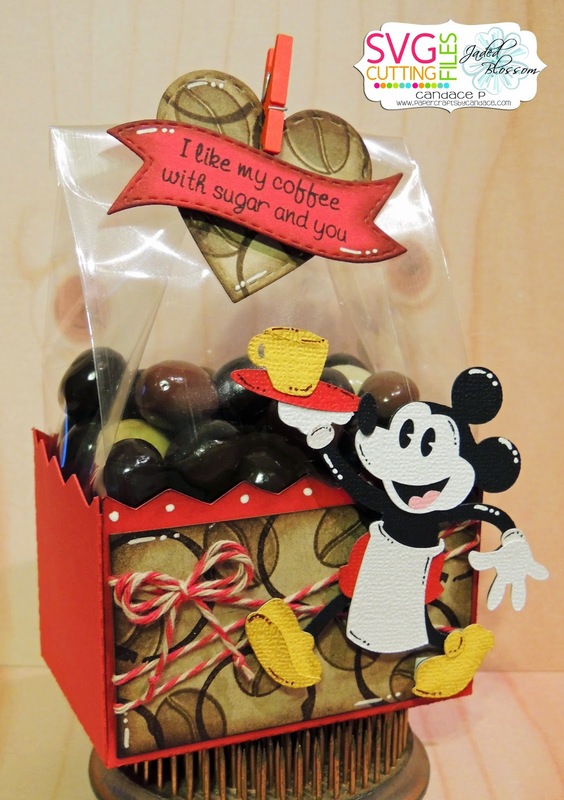 Love vintage Mickey and the coffee beans are so cute! I love love this one! I love this little message and your details are amazing. I love it, thanks for the idea. YAY! Perfect ending to an awesome hop! Love me some Mickey! Super cute project! And I just love that saying! Geesh...my wishlist continues to grow! OMGosh! This is so adorable! Love it! Vintage Mickey is the best! Seriously, love your project! Perfect for all my coffee buds! Love classic Mickey very cute!!! Fantastic gift for a man or anyone. Not too girly. Love the vintage Mickey Mouse. Great Hop!! As always you and Annie's files are perfect for each other. Thank you!! Love the Vintage Mickey Mouse. Great box. I love the basketball file! This is perfect! My daughter starts this week! Love this it just perfect!! Mickey!!!!!!! Love it, thanks for sharing!!! Love Mickey!! Your project is so cute! Great project! Is that some Krafty Red Trendy Twine I spy? Love it! Adore this mickey, well done. OMG- TOOO cute, love all the details, especially the sentiment. I must say your Mickey rocks! I for sure need to make this for my husband, he would love it!! 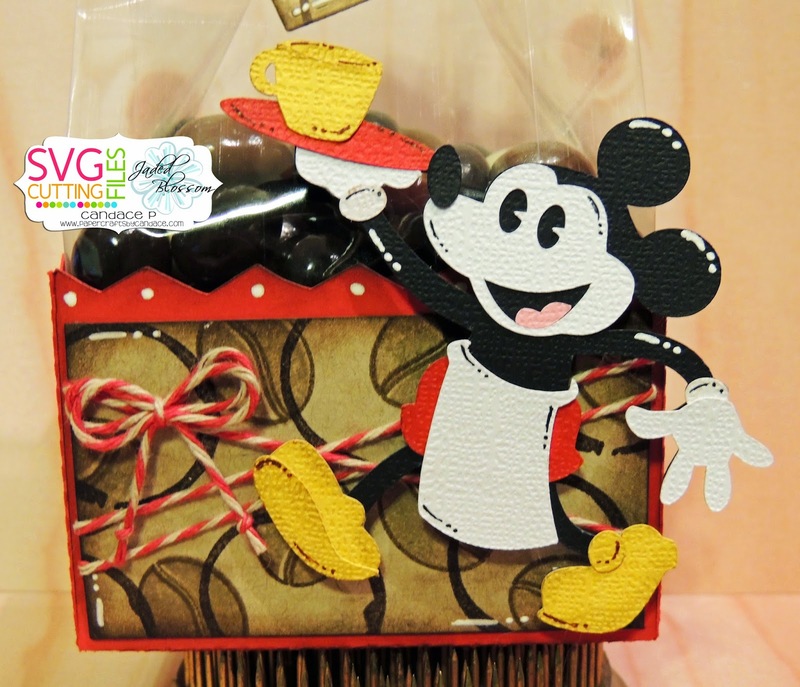 Vintage Mickey and anything chocolate covered especially espresso beans are out of this world! Your husband is a lucky man! Fabulous job on the coffee paper! I <3 Mickey! Great job! I need to get that sentiment. How cute!!! Great job. Love it !